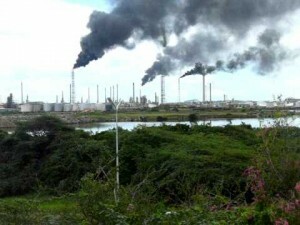 WILLEMSTAD - PAIS wants clarification on an accident which occurred on the Isla oil refinery grounds in October last year. There was also the toxic vanadium, which came free and various Isla employees became sick. Alex Rosaria requested the Minister of Health, Environment and Nature, Ben Whiteman, three times for an explanation. However, until now it was eerily silent. Rosaria asked, shortly after the incident, the first question, then, in December and in March he asked more questions about the fact that the incident is treated as an internal matter only. Rosaria wants to know whether the government has carried out, an official investigation into the incident. He wants to know the cause and whether any similar incidents have occurred in the past five years. He also wants to know whether the oil refinery complies with applicable laws and standards. In addition, he wonders how it is at this time with the health of the Isla-workers who were involved in the incident and whether they are treated medically. Finally Rosaria wants the question answered whether only employees within the refinery have come into contact with the substance or that there may be other people outside Isla became ill.